DESCRIPTION: Adults light blue to grey to purple. Horizontal yellow bar across eye. 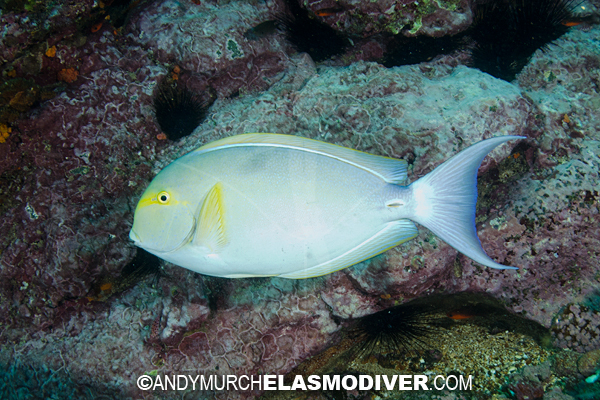 Pectoral fins yellow. Juveniles have a white vertical bar at the base of the causal fin. RANGE: Pacific Mexico to Ecuador. Also Indo Pacific and West Africa. All of the fish pictures on elasmodiver.com are copyright protected. No unauthorized use of these Yellowfin Surgeonfish pictures is permitted. Please contact Elasmodiver for further information.